As I joined the peloton of commuter cycists this morning I was riding with a new determination and purpose. Inspired by Sarah Storey's phenomenal gold medal performance yesterday, I could almost hear the roar of the crowd as I cycled up Pentonville Hill in a new, personal best, time! Sadly I did not reach the impressive (and illegal on most London roads) speeds of around 60kmph they were clocking up in the London Velodrome. And apart from my lack of talent and training, my bike, or more specifically my gears, were also holding me back. where is the diameter (measured in kilometres) of the large front wheel (so is the wheel's circumference) and is the riders cadence – the rate of pedalling measured in revolutions per minute (which is multiplied by 60 to give the number of revolutions per hour). The only way to increase your speed on a penny-farthing was to pedal faster (ie increase your cadence) or increase the size of your wheel. Your cadence is clearly limited by your physiology. And increasing the size of your wheel is impractical for many reasons: not only is it a drastic change to your bike but it is also limited by how far your leg can reach from the seat at the outside of the wheel to the pedals at the centre. 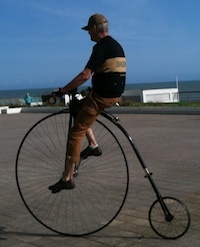 The largest penny-farthing ever made had a front wheel with a 64 inch diameter, though most were 60 inches or less. The great revolution came with the invention of the chain drive. Not only did it allow for greater stability as the pedalling mechanism moved to the centre of the bike between two equally sized wheels, it also allowed cyclists to go at a great variety of speeds while maintaing a similar cadence. Rather than directly turning the wheels the pedals on most modern bikes, including my trusty steed, turn a front chain ring (with, say, teeth) which is attached by the chain to a sprocket (with, say, teeth) on the rear axle that turns the back wheel. For each turn of the pedals the front chain ring pulls the chain forward by teeth, the chain then turning the rear sprocket, and hence the back wheel, times. If the front chain ring and rear sprocket both have the same number of teeth then the gear ratio would just be 1 – for every revolution of the pedals the back wheel would make exactly one turn, just as for a penny-farthing. But we can increase our speed simply by changing our gears. The larger the number of front teeth or the smaller the number of back teeth the further I will move with each pedal stroke and the faster I will go at a set cadence. The gear ratios for my bike and the possible speeds I could reach! My bike has 26 inch (66 cm) wheels and a choice of three front chain rings with 44, 32 and 22 teeth and eight rear sprockets with 34, 30, 26, 23, 20, 17, 15, 13 and 11 teeth. The table above shows the different gear ratios that are possible on my bike along with two other units used to describe these. Gear inches (the wheel diameter multiplied by the gear ratio) is linked to the earliest days of cycling: it is the size of the front wheel of an equivalent penny-farthing. My humble bike goes up to a whopping 104 gear inches, trouncing even the largest penny-farthings. The metre development (the circumference of the wheel ( ) multiplied by the gear ratio) is how far the bike moves forward with each revolution of the pedals. In my quest for speed I need the combination with the highest gear ratio – 44/11 or 4. And even if I could cycle very fast (say as fast as my super fit brother who builds, sells and rides top level racing bikes) the fastest I could hope to pedal would be about 110rpm. This would mean that the top speed I could hope to reach on my bike is just over 54kmph. Though back in reality, where I am more likely to pedal at 60-80rpm, I think 30-40kmph is a more realistic ambition. 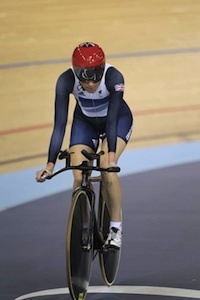 This doesn't come close to speeds of Storey and her fellow paracyclists at the Velodrome. Not only do they pedal much faster (up to 150rpm) they also push much higher gear ratios. And as their bikes are traditionally only allowed to have one gear the choice of that gear has a huge impact on the speeds they can reach. In fact, it is such an important consideration that when we contacted the mechanics for the Paralympic GB last week they said that information was a closely guarded secret. This confidentiality makes a great deal of sense – if a competitor knew you were planning to ride at a higher gear ratio then they would know you had the potential to reach higher speeds and may switch to a higher gear ratio themselves. However the decision is a careful juggling act. The cyclists have to accelerate from a standing start which requires more effort the higher the gear ratio. Imagine accelarating up a steep hill in your highest gear and you might be getting close to the power this requires! No matter how technologically advanced your bike is, in the end the winning ingredient is always the physical power of the rider. And that is what won Storey her gold medal. Congratulations Sarah from everyone here at Plus! Rachel would like to thank her brother Jeremy Thomas for all his expert advice on this article. And also for inspiring her to ride further, faster and higher!